Yes, NOW is the time to take advantage of our Season Ticket offer. 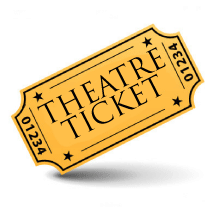 Become a Season Ticket holder and pay for all our three upcoming plays in advance. Just £16 buys you one ticket for each of our three plays. It’s cheaper – an 11% discount making it just £5.33 for a fun night with a cuppa and biscuit included. best of all, reserved seating for all three productions on your preferred evening, no fighting for your favourite seat position. and, of course, the guarantee of having three nights of great entertainment until April 2016. What if I can’t make it to a performance? Gift your ticket to friends or family and let them experience the delight of live entertainment – where else can you get that for the price? If you are interested, simply fill in our web form or phone Steve Turner – details on our Book Tickets page. Click here to see our three productions and performance dates.